Taiwan Bangzi Opera: A Tribute to Shakespeare, Greenwood Theatre, KCL, Sept 11 2009. I went along to this performance full of excitement and expectation. Firstly, I was wondering how the traditional opera company would appropriate a story which is so loaded for a western audience. (Intriguingly, Li Ruru gave a presentation at Nottingham Ningbo in 2008 in which she introduced a production of Merchant in which the Shylock character was simply a greedy Chinese moneylender, removing any reference of race or religion from the storyline.) Aside from this, I have missed the ‘strange sounds’ of Chinese opera: the high-pitched singing, initially unrecognisable as such to untrained western ears, the frantic dungdungdungdung of the cymbal, the strains of the erhu, all accompanied by acrobatics, elaborate costumes and stylized gestures, which nine times out of ten filled the afternoon television schedules (between documentaries on road-building) when I first lived in the People’s Republic of China. I would certainly get my opera fix at this performance, although I found the transformation of the play’s characters a little more problematic. We saw two extracts, ‘The Bond’ and ‘The Debate’. In the post-Holocaust west, it is difficult to see Shylock portrayed as a comic villain, one minute testing his blade on his boot, the next trembling with cowardice at the act he is about to perform – at which the audience here has no choice but to laugh, because in accordance with the rules of the genre, this confrontation between Shylock and his enemies is clearly meant to be a funny scene. But then Shylock is not Jewish but, according to the subtitles, a Saracen. Although there were ancient Jewish communities in China, most notably the one at Kaifeng in the west of the country, this relocating of Shylock’s ethnic and religious identity does make sense, however, in a Chinese context, as the Silk Road traders led to the significant Muslim presence in China which remains to this day. Yet the replacement of a Jewish Shylock with a Muslim Central Asian Shylock creates its own discomfort if put into the context of current tensions in Xingiang between the Muslim Uyghur and Han, or the worldwide context of post 9/11 Islamaphobia. Because the opera’s comedy relies on racial stereotypes, there is a sense that Shylock becomes a figure of ridicule both for ‘Gratiano’ and for the audience (as he probably would have been for the play’s early modern audience). 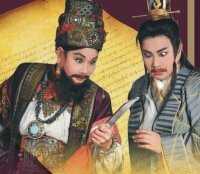 The turbaned, bearded Xia Lou (Shylock) is dressed in pantomime Persian garb of colourful brocades and heavy jewellery, and using animated, over-emphasised body movements and facial expressions. This costuming of ethnicity immediately emphasises his Otherness, especially when he is juxtaposed throughout with the mediaeval Chinese (or Cathay), dressed in their pale, simple robes, their hair hanging loose, their manner self-contained. This is, of course, at odds with most contemporary readings/performances of Merchant, where by the trial scene, we attempt to distance ourselves from Gratiano’s goading. (Even ‘Hath not a [Saracen] eyes’, which is moved to the trial scene, is used here to underscore Shylock’s dogged determination for revenge rather than work as a plea to the audience for the humanity of all peoples.) When Shylock is finally defeated, his punishment, including a ban on ever wearing such ‘outlandish clothes’ is greeted general with laughter both on-stage and in the audience. The ridiculous, audacious foreigner has had his come-uppance. I find myself sitting in the audience unsure how to respond. The performance is enormous fun, but every politically correct nerve-ending in my body is screaming ‘what about gas-chambers, lynching, gay-bashing, stop-and-search, Guantanamo…?’ Then all the action stops, and Shylock steps forward to sing his final aria, and I am not quite sure why (perhaps a slight change in tone of voice or facial expression?) but he is no more the foreign clown or the evil outsider, but suddenly a tragic hero. In an impassioned diasporic song, that seems to speak as much to the losses of overseas Chinese as to any other community, the performance suddenly realigns itself to my expectations. At the post-performance discussion the next day, Professor Perng, the English translator, addressed some of these issues. Their Merchant was intended to tackle the problem of racism in contemporary Taiwan, although as religious conflict is not so prevalent, this had been removed. Moreover, to Chinese speakers, many jokes and puns in the language would help reveal this agenda. Shylock’s family name, Xia, is synonymous with the meaning ‘Chinese’, whereas the family name of the Portia figure is common among ethnic Chinese of Muslim descent. It would be interesting to think further about translation. Professor Perng Ching Hsi, a lecturer in English and drama, translated Shakespeare’s text into Mandarin Chinese, attempting to keep close to the original. Professor Chen Fang, a lecturer in Chinese theatre, transformed his translation into the language, form and conventions of Bangzi Opera. Perng then re-translated the Chinese opera back into English for the subtitles. The figure of the miserly money lender is already a stock character in traditional Chinese drama, according to Zhang Xiaoyang (1996, pp74-5), who compares Shylock to Jia Ren in the comedy A Slave to Money. Finally, this production featured an all-female cast, reversing Shakespeare’s original. From the Ming dynasty until the Qing, women were outlawed from appearing on stage in China. Now, it appears, women may be more interested in performing traditional opera forms than men. LOCAL/GLOBAL SHAKESPEARE: The play on meanings in the conference title, which embraces concepts of Shakespeare at the local Globe theatre, Shakespeare’s dissemination and reception worldwide, and the localisation of Shakespeare in different cultures throughout the globe, made this conference both richly diverse and inevitably disappointing from the start. Despite the inclusive vision of the conference organisers, well, they just didn’t quite manage to convey it visually! Out of dozens of plenary speakers over the three days, all were white and most were British. Only Saturday morning’s Taiwan Bangzi Opera post-performance panel, speaking on their adaptation of The Merchant of Venice, followed by the address of Indian director, Rustom Barucha, was an exception. As a delegate from the Philippines said to the Chinese American and Japanese delegates over a pint at the end of the first day: ‘Don’t you feel a bit like a token here? !’ Likewise, the first breakout sessions mostly took place along the main corridor from the Great Hall, apart from Shakespeare and Africa which was up the stairs and around the corner next to the toilets. Oh yes, and Localizing Shakespeare in Asia, which was up more stairs, down several corridors and around so many corners that five of the speakers failed to arrive for the beginning of the session and had to have search parties sent out to retrieve them. I’m exaggerating for effect, of course, but you get the picture. 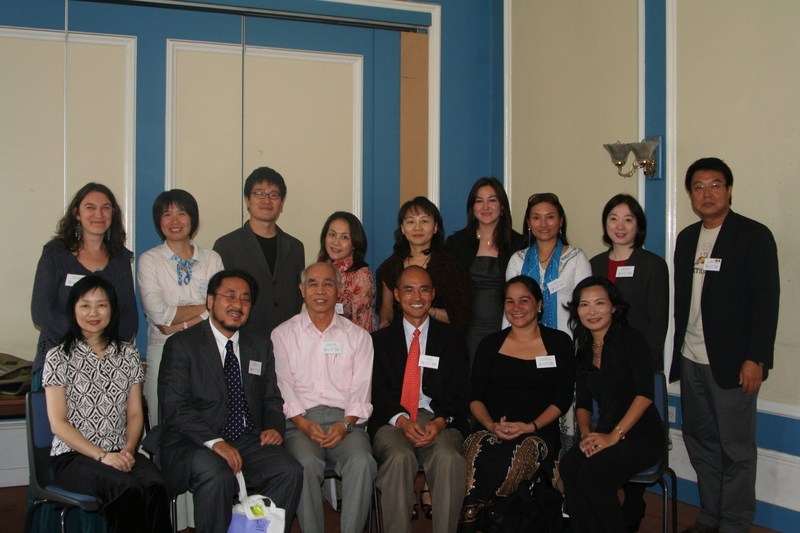 There were fifteen Asian/Asian descent speakers in this Asia room and two auditors, one being me, the other a PhD student i.e. no one of note. Is it that no-one else was interested, or that they just gave up and stayed in Europe because it was easier to get to?! Perhaps the increase in women speakers at conferences shows that change does happen, but slowly. The question is: is it too slowly? Thus it is that my reflections have developed a certain theme…. I attended the mini-symposium held earlier this month at the University of York on Shakespeare, Peel and Performance (2nd Nov 2009): Judith Buchanan (York) introduced two silent film recordings of Hamlet, Alex May (York) discussed the performability of Peel’s ‘Edward I’ and Michael Dobson (Birkbeck) looked at ex-pat Shakespeare in 19C Geneva and WW2 German prison camps. Apparently, the young Denholm Elliott was the most sort after girl in town after he took to the stage as Rosalind, or was it Juliet?… I will reflect on my notes from these sessions in another place, but for now I want to simply muse about a couple of connections I made during the conference to my initial response to Lin Zhaohua’s Hamuleite. Connection 1: Buchanan introduced her talk with a clip from director Hay Plumb’s 1913 Hamlet starring Johnston Forbes-Robertson in the title role. This feature film, which as Buchanan pointed out, resisted any attempt at being ‘filmic’, chose instead to adhere closely to Forbes-Robinson’s recent stage production. As a result, the audience was treated to the bizarre spectacle of Hamlet entering, sitting down and speaking uninterrupted for several minutes until Ophelia entered immediately after the first intertitle. This intertitle was the first overt indication that the scene we had just witnessed was Hamlet’s ‘To be or not to be’ soliloquy. It had been spoken in full, the actor slightly turned away from the camera to emphasize his interiority, and delivering his lines in a measured, realist style. Except, of course, that the film had no soundtrack… As I think Buchanan was suggesting, reverence for the text and stage performance so dominated this film that the scene was rendered nonsense. Only an audience who knew the play could contextualize it and would have to supply the words for themselves. Of course, because the film was Hamlet, and because we were in a university, English Lit setting, most of us could probably do this, getting the gist at least. Perhaps in 1913 a few more of the general public could do this, too. And this brings me back to Lin’s Hamuleite. As I sat in the Tokyo Globe with my Japanese friend Eiko watching the Beijing People’s Art Theatre perform the First of Shakespeare’s Great Tragedies in Mandarin Chinese, I understood exactly what was going on. This was despite the fact that the only words I managed to pick out were fuqin (father), shushu (uncle), wang (emperor or king) and che (to eat)! Pu Cunxin, who played Hamuleite/Hamlet, helped out a bit now and then, by wiggling his fingers in a wormy way when he showed the Claudius figure ‘how a king may go a/progress through the guts of a beggar’ for instance (4.3 in Shakespeare’s version). Admittedly, I couldn’t remember the gravediggers being in it quite so much, and I was sure they hadn’t appeared at the beginning, but it was still recognisably Hamlet. It was only years later when I read Li Ruru’s chapter on this production in Shashabiya: Staging Hamlet in China (2003) that I realised how much I had not got. I had not realised that Hamlet and Claudius frequently swapped roles, because they changed neither tone of voice nor costumes/prop indicators. As for ‘To be or not to be’ being shared by Hamlet, Claudius and Polonius in order to highlight the director Lin’s ‘essential idea that “everyone is Hamlet”’ (Li, 2003, 90), well, that completely passed me by. ‘Are you sure you weren’t confused?’ my friend Eiko, a fluent Mandarin speaker, had asked as we left the theatre. This raises several questions for me. First and foremost is whether or not I can justify writing on a performance when I have so little a grasp of the language it is being performed in that I am not able to pick up on the central interpretation of the production unaided! Yet the particular performance I went to see was being performed for an international audience on a foreign stage. Many people in the theatre either did not understand the language (although as it was Japan, it was possible to get earphones with a simulcast interpretation), or they did not know the play beyond reputation. Did I get any less from it than a native Chinese speaker, or did I just get something different? If a non-English speaking Chinese tourist pops into the Globe for a matinee performance of an English Hamlet, are they having any less of an ‘authentic’ experience than I would be having if I were there? It also raises questions about the canonicity of Hamlet. Why is it the role an actor wants to be remembered for, even if the medium for archiving that role can only give an incomplete, amputated remembrance? Why is Hamlet so often the first play translated – into Chinese, into Arabic etc – although it is not always the play that is most performed? It’s getting late and dark, so my other connection, equally vague and random, will have to wait until next time. When I met with my Chinese tutor on Tuesday to brush up on my Mandarin, she looked at me and said, ‘We know Hamlet in China. When I was a little girl we learnt at school a famous saying: yi qian ge ren yan li you yi qian ge Hamuleite; there are one thousand Hamlets in one thousand people’s eyes. We learnt this to tell us there are different points of view.’ She didn’t learn anything more about Shakespeare or Hamlet at the time, it appears, but it is this way that Shakespeare, and particularly that most canonical play of his, not only travels but goes native that lies at the heart of my research. What I want to say about this, I am not yet quite sure! (‘This is all very interesting,’ my supervisor says, ‘but what is your research question?’) But if I can begin to unpick three or four of these thousands of Hamlets, maybe I will find some answers to ‘why Hamlet?’ There are issues of cultural imperialism that perhaps lie behind the fact that this tragedy is often the first to be translated into a new culture, either because it has been imposed by a Western colonial education system, or because it has been taken up by the indigenous scholars and artists of a country as part of their mission to ‘modernise’. This was true of both Mainland China and Egypt in the early 20th Century and late 19th Century respectively. However, in both Chinese and Arabic culture Hamlet has been appropriated to speak about what it is to be Chinese or Arab at the turn of the Millennium. Lian Zhaohua’s 1989/90 avant-garde stage version broke all the conventions of Chinese Shakespeare. Gone were the blonde wigs and prosthetic noses (Li, 2003), the traditional ‘white-face’ acting that emphasised the Other, the foreigner, in huaju spoken theatre. Instead, Lin made his Hamlet and Gertrude et alia to be Beijingers in contemporary dress. It was no longer a play about the Danish court or Shakespeare’s England, but (perhaps) about Deng Xiaoping’s economic reforms and the uncertainty that follows the death of an ideology. And apparently, in the English-Arabic Al-Hamlet Summit, Ophelia becomes a suicide bomber… These new revisionings seem to me to be doing just the same as Shakespeare when he first began to play around with his source, whether it was an Ur-Hamlet or Belleforest’s Renaissance take on Saxo’s Viking deeds. There are one thousand Hamlets in one thousand people’s minds.